Fit-N-Trim has two conveniently located training sites in Rowley, MA. Our outdoor rings and covered arena are at 103 Haverhill Street (Rte 133) and our heated and air-conditioned indoor facility is at 108 Newburyport Turnpike (Rte 1). 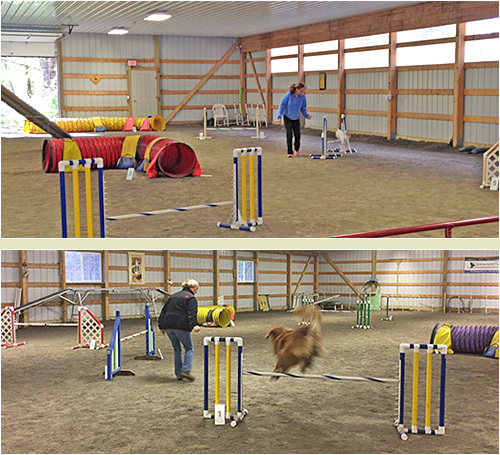 Two outdoor, three-season, fenced rings are used for agility classes and practice. The 120′ x 72′ primary ring has a sand footing which is not slippery when wet and keeps the mosquitoes down. 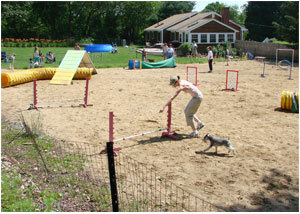 Our smaller grass ring is great for beginner agility. Our bright, indoor heated and air-conditioned training facility has been completely remodeled and has a dog and people safe rubber floor. It provides an ideal venue for our Puppy Kindergarten and Manners classes as well as for seminars and courses such as Introduction to Breed Handling and activities including our Puppy and Mighty Minis Romps. The indoor facility has also enabled us to schedule Canine Chiropractic appointments with Dr. Sue Ferguson and Canine Massage on a monthly basis. Check the Special Events page for dates and times.